Breakfast used to be a struggle at my house. You see, we prefer a sweet breakfast, most of the time, over a savory one, and the sweet options aren’t always that great. A fight between healthy (oatmeal, yogurt) and easy (cereal, store-bought pastries) would ensue and it most often ended with regret or uneaten food (which ultimately leads to regret). Until, one day I started making Zucchini Bread. And now breakfast churns along smooth as butter (there is none in this recipe by the way) unless, of course, we run out. Nothing really beats home baked in my mind. I know exactly what is in there and I feel good about it. In addition to the fact that I am not serving/eating a processed food, there really are very few ingredients that are processed either. There’s actually a fair amount of real nutrition packed in from the zucchini, eggs, applesauce and whole wheat flour. The whole wheat flour seems easily masked by other ingredients. Usually I can only use half whole wheat flour in baked goods, but for this I go to 2/3 whole wheat. While this does require baking in the oven for almost an hour, the electricity is offset by solar panels and so is basically a carbon neutral undertaking for us. After it is baked, it requires no further heating or reheating – so no additional energy or time required. In the summer, fresh zucchini from our garden can go straight into this yummy treat. That is truly the joy of joys. Year-round, we can take eggs straight from the chicken coop (still warm at times) and crack them right into the bowl. We aren’t big egg eaters, and so it is a great joy to use our fresh backyard eggs in baking and cooking. When I shred the zucchini, I usually shred 2 or 3 or 4 portions and freeze the unused portions for future batches. The shredded zucchini freezes really well in a glass jar, pre-portioned (although it seems to lose a lot of it’s girth, so I overpack them). This is a very forgiving recipe. I have experimented with flexing many of the ingredients (e.g. 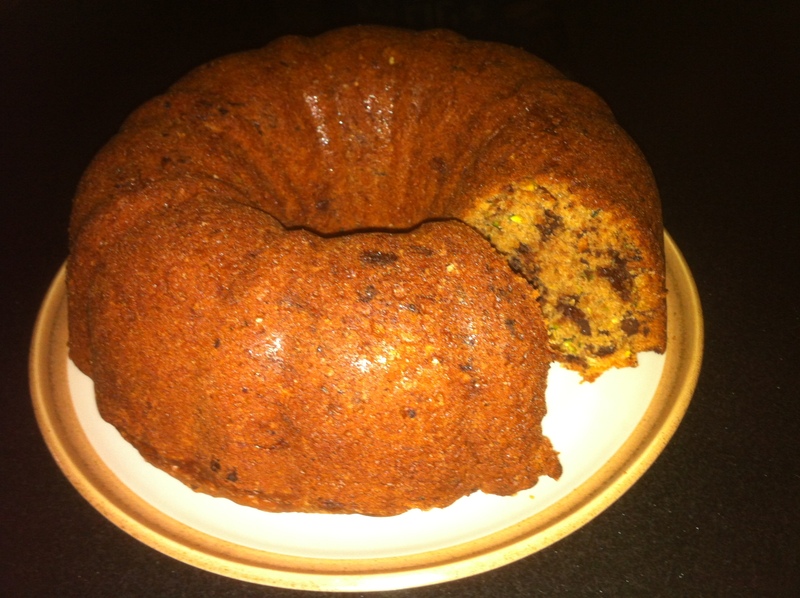 no cocoa, more/less applesauce, different ratios of flour, adding nuts or other fruits, different types of oils, fresh or frozen zucchini) and it always comes out moist and delicious. I personally love baking without butter. Since this is technically a bread and not a cake, it uses oil instead of butter (and I’ve actually reduced the amount of oil by adding in applesauce). Oil is much lower in saturated fat and cholesterol. It never goes bad. It goes pretty fast in our house, but I imagine if I ever thought we wouldn’t eat it, I could freeze it and it would turn out just fine. One batch, will last almost 2 weeks, sitting on the counter and still tastes fresh and delicious. 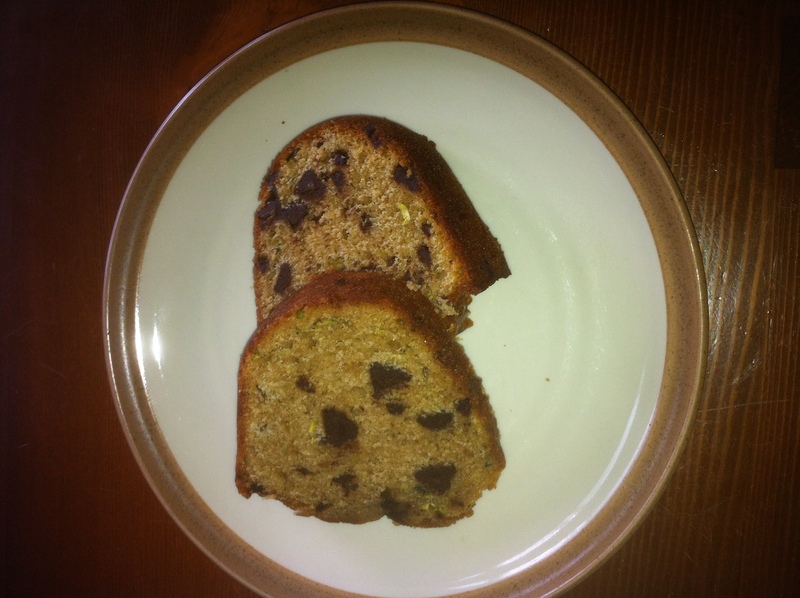 A slice of moist and scrumptious zucchini bread is cherished for breakfast, snack or dessert. We eat our fair share of desserts in our house and they aren’t all healthy, but this one does the job just as good as the chocolate caramel torte, lemon bars, or chocolate crackle cookies. 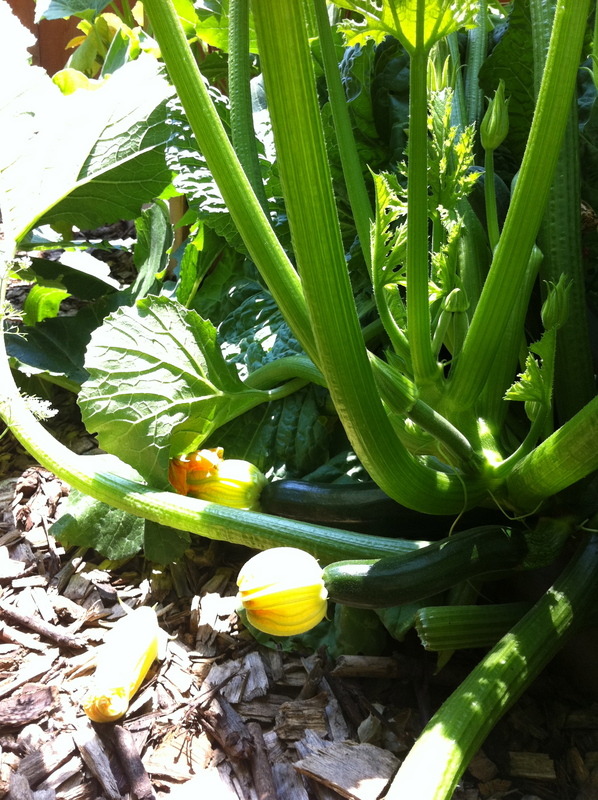 In the winter, there is no good source of zucchini. Most come from Mexico or Central America. And obviously, the zucchini is key to the zucchini bread recipe. This summer, we will try to stock up on fresh, local zucchini – freeze it in various forms and hope that it will last through the winter. More on that in a few months. This recipe requires a bundt pan. And despite many hours of trying, I just could not find a bundt pan without a non-stick coating. We have slowly converted all of our other pots and pans to stainless steel or cast iron. This is the only one that we own with a non-stick coating, specifically to make this zucchini bread. Hoping you’ll love it as much as we do. Sift together first 7 ingredients in small bowl. In a large bowl, beat eggs until light and fluffy. Add sugar, and continue beating until well blended. Stir in oil, vanilla, zucchini, and applesauce. Stir in sifted ingredients. Mix in chocolate chips. Pour into prepared pan(s). Bake for 55-60 minutes, or until a skewer inserted in the middle comes out clean. This recipe adapted from Paula Dean from The Food Network. This entry was posted in Food, The Kitchen, The Life. Bookmark the permalink.